Tabebuia rosea, commonly called pink trumpet, rosy trumpet tree or pink poui, is an evergreen (usually considered deciduous in climates with a dry season) tree with a long, smooth trunk topped by a rounded spreading crown. It typically matures in the wild to 60-90' tall and to 30-50' wide, but usually grows shorter in cultivation. It is native from Mexico through Central America to Venezuela and Ecuador. It is best noted for its often spectacular bloom of showy, trumpet-shaped, purplish-pink to white flowers (2-4" long) with yellow throats which bloom in clusters (up to 30 flowers per cluster) at various times during the year. Bloom schedule in part depends upon the climate where the tree grows. In climates with a distinct dry season (e.g., March - May), the leaves of this tree will typically drop at the beginning of that dry season. The dry conditions subsequently trigger a mass bloom near the end of the dry season when the tree branches are still bare but the rains have begun to fall. In climates where rains occur throughout the year (no dry season), flowers tend to bloom intermittently through much of the year in smaller but more frequent bursts of bloom. Flowers are followed by bean-like pods (8-12" long). Each palmate leaf has five, leathery, scaly, elliptic to elliptic-oblong, toothless, medium to dark green leaflets (central one to 12" long) with undulate margins. Rosy trumpet tree is the National Tree of El Salvador. It is an important timber tree in Mexico and Central America. Synonymous with and formerly known as Tabebuia pentaphylla. Diagnostic: Among all the Tabebuia species planted in Singapore, this is the only one where the leaflets are the largest, and ends with sharp apiculate tips. There are species that have similar looking leaves, like Ceiba pentandra and Sterculia foetida but their leaflets are stalkless. 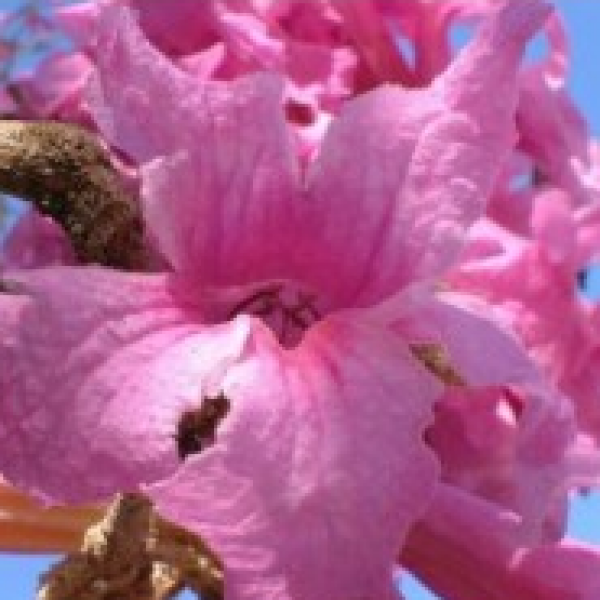 Interesting Facts: Tabebuia rosea is a very popular tree planted along roads and parks. As of 2009 (Tan et al., 2009), its total numbers in parks and streetscapes managed by NParks put it as the top 6th most commonly cultivated tree with 13,299 individuals. As with its other congeners, the leaves are palmately compound with five stalked leaflets. During the months of Apr, and Aug-Sep, a spectacular bloom occurs, and the entire tree will be covered by its pink or white flowers. The flowers drop after awhile and the grass patch beneath will be then covered by a carpet of pink or white. The fruits are long pods which split open to release winged seeds that rotate like a helicopter to slow their descend, aiding dispersal.